Cloudy yellow color as found in most wheat based beers. Light to medium bodied with good flavor and no bitter finish. 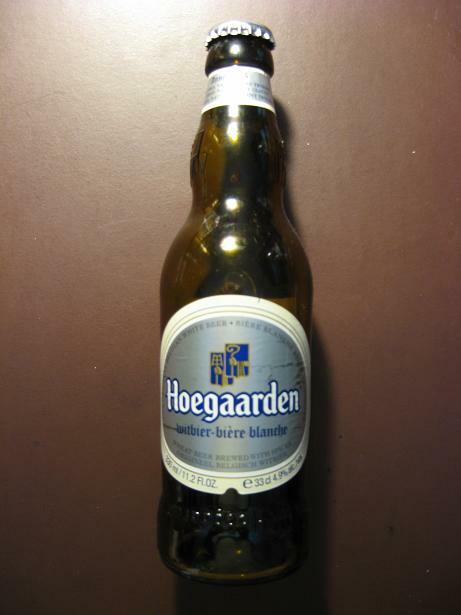 This one claims to be the "original" Belgian wheat beer. Also states, "...brewed with spices...unfiltered, naturally cloudy..." on the label. All true statements of the drink I sampled. Typical of most wheat or wit-beers is that it uses the traditional ingredients of water, yeast, wheat, hops, coriander and dried Curaçao orange peel, also known as Laraha. It is a wonderfully well balanced wheat beer and does not possess the 'wheatiness' of flavor found in other wit-beers. We've sampled the 'spade' in Spaten. Now we have the other tool from the shed; the Hoe! Can you dig it?